Songs of Eretz Poetry Review is pleased to present “Sometimes in June” by Carl Boon. A native of Ohio, Carl Boon lives in Istanbul, where he directs the English prep school and teaches courses in literature at Yeni Yuzyil University. Recent or forthcoming poems appear in: Posit, The Adirondack Review, The Tulane Review, Badlands, The Blue Bonnet Review, and other magazines. a little fall will startle you. twirls her purse on her thumb. sweeping her balcony of leaves. A forecast of rain and cool. Poet’s Notes: In "Tjanting", Ron Silliman observes that, "Reddest red contain red blue." "Sometimes in June" carries that notion to the realm of time and seasons, in which a trace of a smell in summer seems to contain fall. 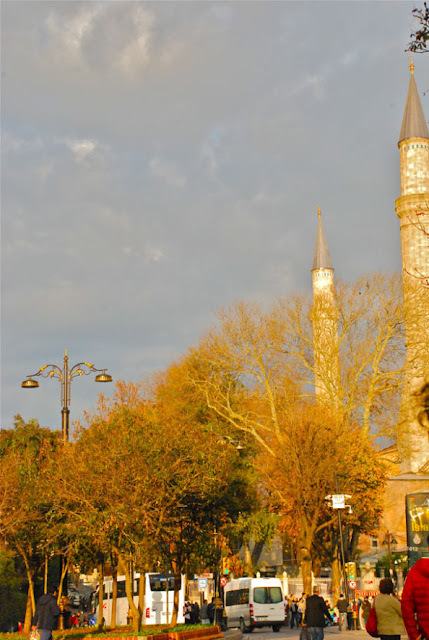 The poem begins with that idea, and then continues to portray images of fall in Istanbul. Editor’s Note: The poet creates a quiet, magical mood here that draws me into a special moment.